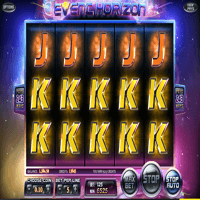 Event Horizon is a 5-reel, cosmic-themed video slot with 243 pay-ways. 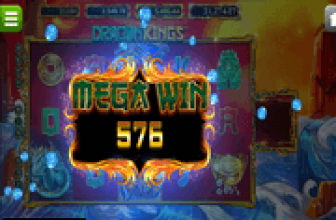 Developer Betsoft pulled together traditional reel elements and a contemporary win-boosting feature in creating a mesmerizing video slot with a capability to reward as many as 144,000 coins to slot players. Classic reel icons, such as the number 7, the triple, double and single BAR signages, the bell, the cherry-cluster, and the A,K,Q, J and 10 symbols, all look resplendent with their metallic sheen. Any one of those symbols, including the Wild, could fill up the entire slot screen through the workings of the game's Sync Reels mechanism. The result is an Event Horizon big win, as nothing can affect the certainty of hitting multiple pay-ways once a single symbol fills up all five reels. Betsoft's Event Horizon has no Free-Spins Round or Pick-Me Bonus Game to offer. Yet the game has been configured with a Sync Reels mechanism to bring coin-wins in massive amounts. During the reel-turning motions, every spin creates a chance for the icons contained in Reels 2, 3, 4 and 5 to synchronize into becoming reels filled with rows of like symbols. 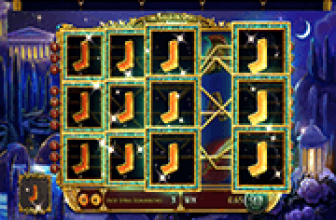 As a win-boosting feature, it increases greatly a slot player's chances of launching a spin that returns with multiple pay-way wins. All reels, including Reel 1, could emerge as containing rows of five-of-a-kind symbols. Game info states that as many as 144,000 coins could be won from a completed Sync Reels occurrence. The equivalent payout though depends on the synced symbol and the value of the total bet placed on each spin. Denoting that, the greater the value of the total bet, the higher the corresponding payout received by a slot player. However, payout rules state that only the longest formed pay-way wins will be paid. Since the reel synching process could take several spins before icons become completely aligned into like-symbols, Event Horizon slot players can still count on the game's Wild Symbol to increase the likelihood of achieving pay-way wins with every spin. The Event Horizon Wild presented as a shiny Celestial Orb, depicts the concentric sphere around which all Event Horizon reel icons align as a complete same-symbol reel. 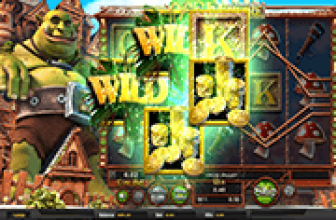 Serving the usual functionality of replacing regular icons in order to form pay-way wins, the Celestial Orb Wild Symbol also appears only in Reels 2, 3, 4 and 5. Nonetheless, its emergence in any of those reels, whether singly or in multiples, greatly enhance the potential of landing on pay-way wins. More so, when all five reels gradually appear as synchronized symbol outcomes of a spin. This Betsoft game creation is low variance, as Event Horizon players can place bets based on coin values ranging from 0.02 to 0.25. They can place as few as one (1) or up to as many as five (5) coins per line. A minimum bet to cover for all 243 pay ways can be as low as £/€/CAD/AUD25 or as high as £/€/CAD/AUD125. Event Horizon Slot Awesome Sync Reels Feature!